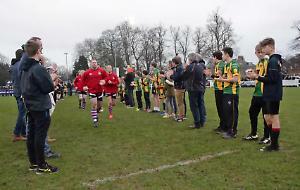 HENLEY Hawks Women had to settle for just a bonus point as they went down to a late score at home to Trojans in their second Championship match of the season at Dry Leas on Sunday. Henley kept the ball from the kick-off and made their way into the Trojans half with an early penalty. Pressure at the ruck led to a turnover and the fly-half cleared the ball back to Henley hands. On a strong run, Davies took a high tackle which cruelly ended her match, and Nash was the first off the bench. Henley turned the ball over in the rucks in the Trojans 22 to put them under pressure. Hard lines from Matthews and Wysocki-Jones kept the ball moving forward, and the Hawks moved it wide for Edwards to score her maiden try for Henley which was unconverted. Henley took the restart and made confident metres up the pitch, only to be quickly undone by an interception which saw Trojans run in an uncontested try to level at 5-5. The game continued to fluctuate with both sides finding space to run in but unable to maintain possession for long periods. Trojans persevered with their kicking strategy with mixed results as the Henley back three were positioned well. Davidson kept the Hawks on the front foot with several snipes from the rucks and quick tap penalties. The backs and forwards linked well with Baker and Simpson both keeping the contact close and making metres. Solowin, being typically difficult to tackle, drew in several defenders and quick ball allowed Hearn to catch the defence on the back foot and power over to make it 10-5, as the try was unconverted. Saverton took the restart confidently but loose hands saw the Hawks back in their own 22 and under pressure. Despite winning a penalty and an extra 10 metres gifted by back chat, the hosts conceded the unconverted try to level the scores at 10-10.
Henley came out fighting in the second half as Burger made good yards in her new role as a forward. Turnovers were aplenty for both teams but Henley were making themselves vulnerable by being too high with the ball in contact. Trojans reacted quicker to a loose ball and their flanker charged under the posts to take the lead, unconverted 15-10. Tavinor and Hill both took to the field and immediately contributed with Hill making fast forward progress and Tavinor scrummaging effectively. Trojans were pushed back to their own try line and gave away successive penalties. Quick thinking from Hearn on a penalty allowed her to feed Edwards running hard to crash over. The try was unconverted to lead the score at 15-15. With less than 10 minutes to go Trojans finished the more determined of the two sides and forced their way into the Henley 22. The physicality of the match seemed to have taken its toll and a ragged Hawks defence was penetrated three minutes before the whistle for Trojans to win 22-15 with a converted try.